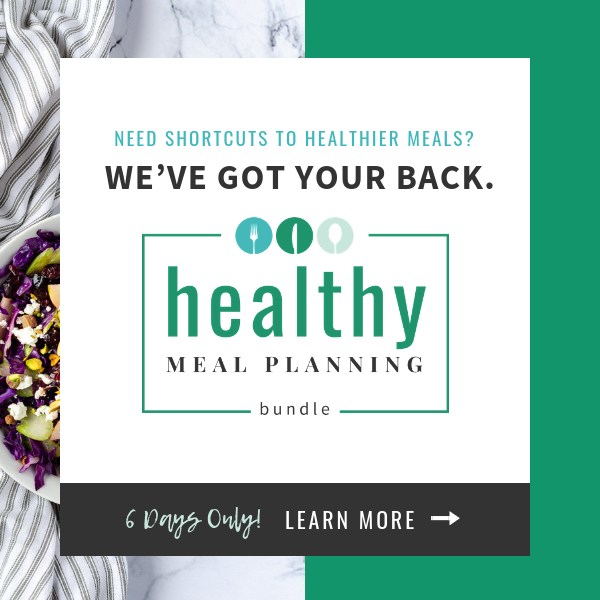 A lot of us fall into the trap of eating light breakfast and lunch in the erroneous belief that this will somehow keep us on track of maintaining optimum weight. This couldn’t be further from the truth. But, what it often leads to is heavy, oily snacks like samosa, chips, namkeen at 4 pm and a heavy dinner that almost always makes you pile on the weight. As a mother and a wife, my biggest challenge is to provide healthy 4 pm snack to the kids and the husband, not to mention eat healthy myself. Trust me after a lunch at around 12.30 – 1 pm, all of us are raring to refill our energy reserves in the evening. Most times, I turn to dosas, poha, dhokla, sandwich and sprouts bhel as a snack. Sometimes it is omelette and bread and at other times it is namkeen like puffed rice mix etc. Since I came to know that each samosa has about 400 Calories, I have stopped having them except as an indulgence. But there are times when we are traveling or when I go for a meeting, that I reach out to unhealthy, oily snacks. What to do, the time is such when your energy is low and you look for a tasty perk-me up. Well, there is an answer to our woes that is both healthy and delicious! Frankly, I enjoy flavoured yoghurt once in a while and do make my own smoothies occasionally. Dahi or plain yoghurt is generally had along with my food. But, I never thought of yoghurt as my 4 pm friend. Come to think of it, it is the perfect substitute for hunger pangs. And with its high dose of protein, Calcium and nutrients, it is completely guilt free too. In a travel-friendly packaging, just pop it in your purse or bag and you have a snack on the go. 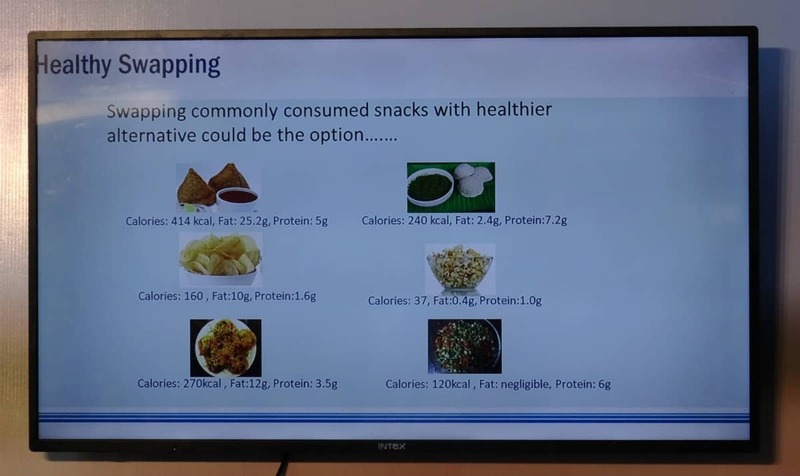 No more do you need to pick up unhealthy snacks from cafeteria or roadside stalls. I have tasted Danone Yoghurt even earlier. It is definitely superior to other similar brands in the market. It is flavourful and delicious. And their flavoured yoghurt with fruit is way better than what it on Indian supermarket’s shelves. They have more and visible real fruit content, not some synthetic flavor (yuck!). They are low on sugar. Each serving has 12 g. sugar. This matters a lot to me because I just don’t like very ‘sweet’ yoghurts or any sweets for that matter. To my palate, it is of perfect sweetness. They come in luscious variants like mango and blueberry. And they will be launching peach and lychee flavours in the festive season. I can totally see them flying off the shelves. They are perfect for kids as they are a safe and natural food and come in kid-friendly flavours. I hate it when I see kids with a chips packet and a Coke can being a common occurrence these days. 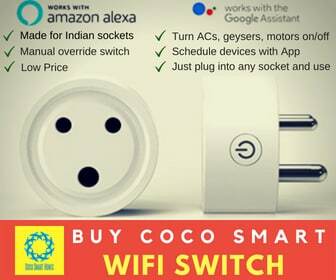 I am glad that they are expanding their network in India, and I look forward to more products in their range. 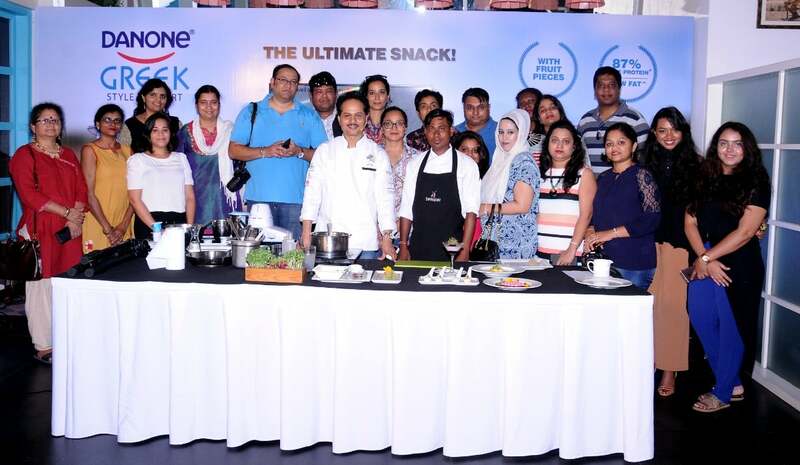 Recently I attended the launch event of Danone Greek Yoghurt in Fava, UB City, Bangalore. The session involved a talk by the Danone team where they explained a bit about Greek Yoghurt in general and Danone range in particular. Shefali from their team shared information with us. What stood out for me was Danone’s commitment to quality, right from the product to maintaining the cold chain through transit and at their retailers so that we get the perfect tasting and quality yoghurt. Nutritionist, Dr. Madhavi Marathe shared some very interesting facts about Greek Yoghurt and also why it is such a healthy snack. Greek Yoghurt is very simply the thicker version of the yoghurt we have at home from which most of the whey has been drained out. Something similar to the hung curd we make. The difference is that it is fortified with more protein. Also since most of the whey is drained out, it has fewer carbohydrates. Thus, it is higher in protein and lower in carbohydrates. Also, since it is made from 2% milk instead of the full-fat dahi that we make at home (to make it thicker), it is really low on fat. Great for those watching calories and wonderful as an after-workout pick me up. Why is Greek Yoghurt good for us? High Protein: Each serving has about 15-20 gm of protein. It is an excellent choice for breakfast or snacking. Probiotic: Yoghurt is excellent for the gut with its gut-friendly bacteria that help in digestion. It is also good for those with lactose intolerance as most of the whey is drained out. Low Carb: If you are watching calories and want a high protein- low carb option, this is your friend. Low Fat: This will make many weight watchers very happy. 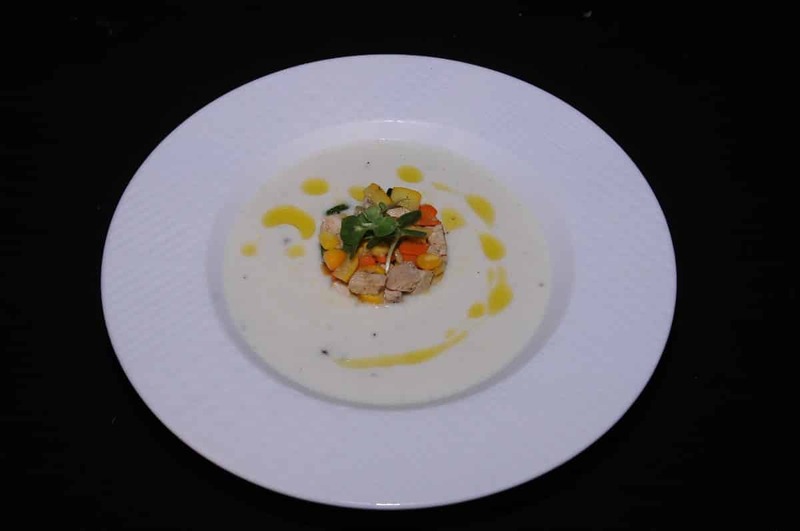 Chef Saha from Fava demonstrated some really interesting recipes that one can make with Danone Greek Yoghurt. 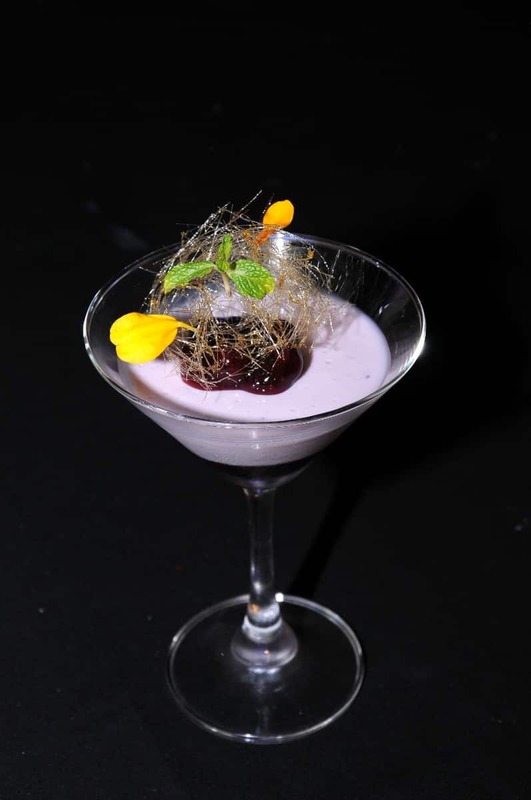 They included Supernutrient smoothie, Beetroot Carpaccio with Beetroot Labneh, Soup, Mango Yogurt Sphere with Blueberry and Feta Cheese Faux Caviar and Blueberry Panna Cotta. These were really delicious. I am sure that this session inspired us to be more creative when using Yoghurt at home. 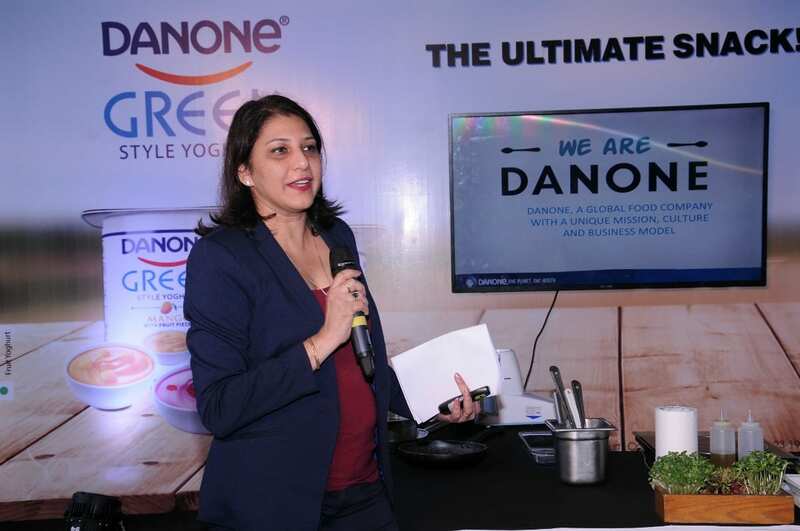 Hence, we got to see how so many interesting recipes could be conjured with Danone Greek Yoghurt variants. 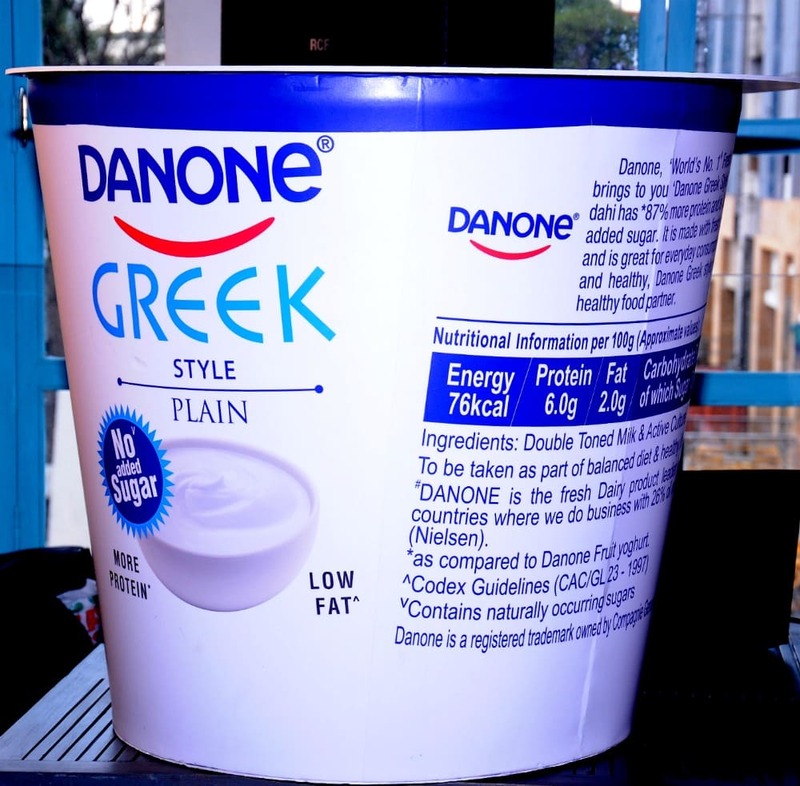 Whether you like to cook with it or have it plain, it makes sense to incorporate Danone Greek Yoghurt in your daily life as #TheHealthySwap for all the unhealthy snacking that most of us do. Thus got over a well-organized event that each of us enjoyed attending and learning from. Do share with me if you consume Greek Yoghurt and its flavoured variants regularly. Between Gy and me, we finished all the yoghurt boxes. She preferred the mango to the blueberry. I liked both ? The sugar-free aspect is definitely a big draw for me! Loved the integration of Insta posts in the blog post. Nice! That was a fun session, made all the more so by the good company that day. Oh I love the last picture, the group one! Couldn’t download it on my laptop. First things first – those pictures are absoltely beautiful – food can look so colourful, the presentation is stunning. I’ve come to like a lot of Danone products – Their Mishti Dahi is a regular at our table. N loves it. I haven’t given their yoghurts a try. They do seem something I’d like, specially because of the low sugar content. The kids don’t like pieces of fruit in their yoghurt so I see a roadblock there but no harm trying a healthy snack. Thanks Tulika. Yes, it was quite amazing to see the Chef at work, very Mastercheffy. And the dishes tasted so good too. He worked so hard on the look of the food and the presentation. Fava is a place known for its excellent innovative food and I could taste it there. I think you can try their plain yoghurt and make your own smoothies with fruit if your kids like it. 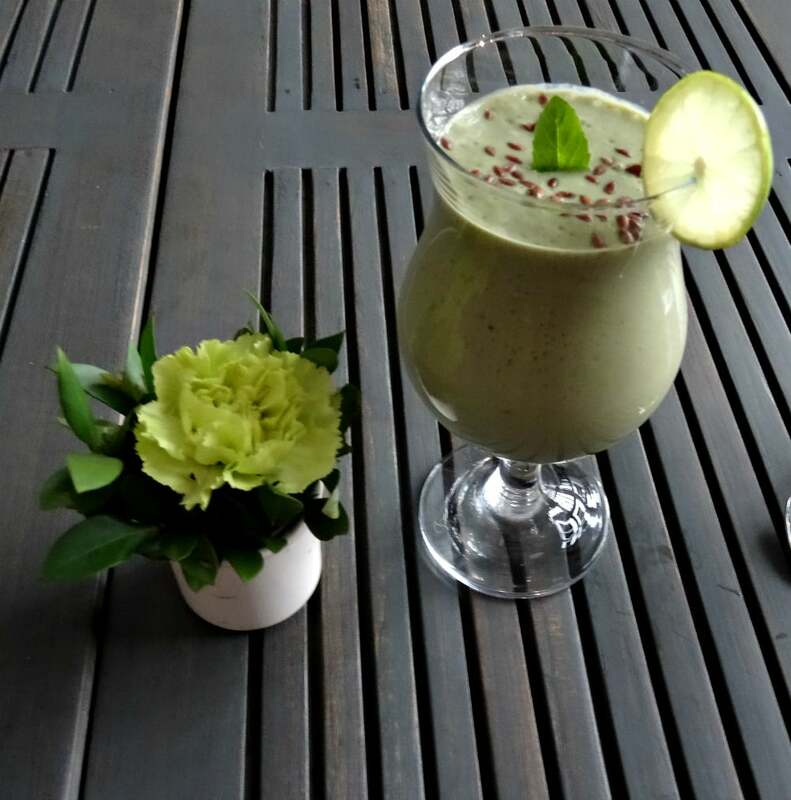 We make smoothies with avocado, strawberries etc. They taste great with honey and of course we can add flax seeds, spirulina etc. to them. That smoothie he made was so delicious.